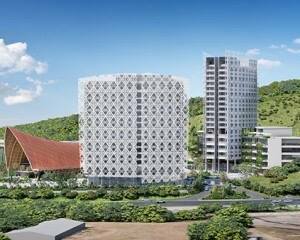 The PNG Government has committed K300 milion earmarked for the building of the Star Mountain Plaza in Port Moresby. Managing Director of Mineral Resource Development Company (MRDC) Augustine Mano confirmed on a tour on the site today. Mano said this is a milestone as it is also the first time that the government has stepped in to partnering with the landowners in a major project. “The State participation on this project shows partnership between the landowners and the government. We’ve had two NEC decisions, one in 2014 on the concept which the government had approved and the second was in 2015 which is the project agreement,” Mano said.